Today, in a politically convenient moment, the British government released new information about the poisoning of the British spy Sergej Skripal, his daughter, and three other persons. 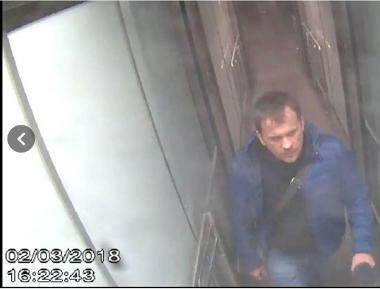 It claims to have identified two men with Russian passports who arrived in London from Moscow on March 2, went to Salisbury on March 3 on a ‘reconnaissance’ trip, came back to Salisbury on March 4 to put Novichok poison on the doorknob of Skripal’s home and flew back from London to Moscow on the same day. The names of the men were given as Alexander Petrov and Ruslan Boshirov which are Russian language equivalents of Joe Smith and Sam Jones. These names are likely false. The police says that CCTV pictures were taken at several steps of the men’s travel. The British news agency Reuters seem to distribute these. Several media have picked up copies. 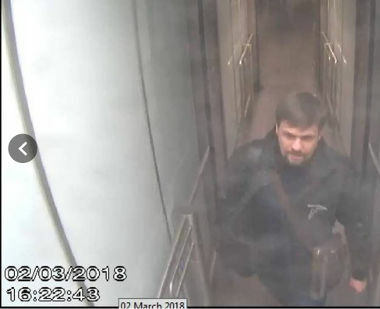 Here are screenshots of two CCTV pictures, taken from an 18 picture gallery in a report by The Independent headlined Salisbury poisoning suspects are Russian state assassins, Theresa May tells MPs. These are pictures 7 and 8 of a 18 picture gallery within that piece. The pics are also available at the Metropolitan police site: 1, 2. Notice that the time stamp on both pics is identical, 02/03/2018 16:22:43. 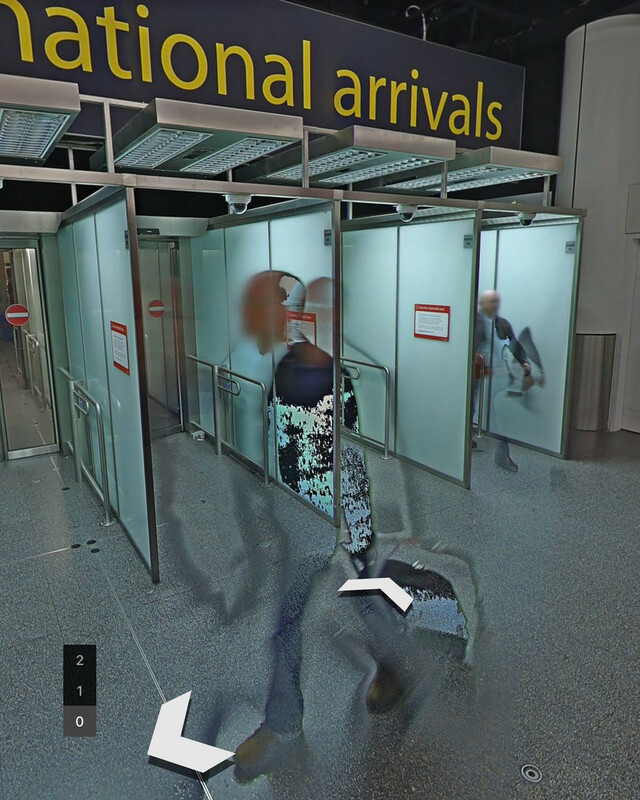 But the pictures show two different men, each walking alone through the same part of a jet bridge as they arrive in Britain. How can it be that both of these pictures were taken at the exactly same second? And who tilted the permanently installed CCTV camera between the two shots? How did the camera angle change between picture one and two which were apparently taken at the very same place and at the very same time? If these two pictures can not be trusted how much can one trust the other CCTV pictures the Met showed to support its claims? Here is the answer to the above questions. In the North Terminal of Gatwick Airport, at the northern end of arrival level zero, there are several parallel and apparently identical gates leading into the airport. Each of these has a camera. Thanks to Bruce Leidl who found the above picture in Google maps. The two pictures above with identical timestamps were taken in two of these gates with each of the ‘Russian assassins’ passing through one of them at the same time. Aeroflot flights from Moscow are serviced at the North Terminal. End of the Update – the original text continues below.